There has recently been some discussion on the net about people flying Corvairs in cold weather. Specifically some builders were concerned that you have to warm up the engine for an extended period, and people were wondering if this could be shortened by having a thermostat of some sort. Some of the tone of the conversation suggested that these were conditions that might never have been encountered before of something I was never involved in testing. Neither of these assumptions are true. I have long known every detail of the Corvairs oil system, and it application to flight engines in great detail. Anyone who would like to learn more on this can write me with any question, review the sample of data taken off our website, or they can come to any college. Asking questions on the internet and sorting through various replies is not as efficient use of time if your goal is to build, finish and fly your plane. If you would like to hear a variety of opinions from people whose data is derived from zero to one Corvair engines, ask the net. If you would like to learn facts from years of testing, ask me. It’s your time and your engine, you decide how to spend it. First of all, the Corvair has an outstanding oil system. Think of how few core engines ever seen have any kind of damage inside, in spite of having 100,000 miles on 1960s quality oil and few changes in the last years of automotive operation. The work we have done to develop flight oil systems in evolutionary on top of this foundation. If you would like an overview of oil systems, read the link just below. Note it is from our website nearly six years ago. Still think there is an aspect of the oil system I don’t know? You are probably going to change your mind by the end of this story. When you start a Corvair below freezing, you want to make sure that it is getting oil to the bearings. This is accomplished by having an oil cooler bypass and having thin enough oil for the bearing clearance. The issue that some people are concerned with is that it takes a Corvair or a lycoming for that matter, 6-9 minutes at an outside temp of 25F to get the oil up to 140F. How fast the temp comes up is not a real issue to the engine, but having circulation is vital to not hurting your engine. 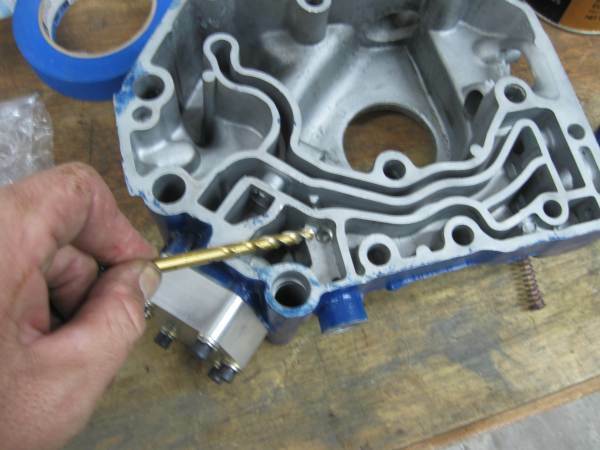 Oil clearance; An engine that has .002″ main bearing clearance at room temp will have less at 25F. Why? Because the case is aluminum and it contracts more than the steel crank. This is a function of diameter. The bigger the diameter, the more starting clearance is required for very cold weather operations. This has been long known and understood in aviation. If you were told that German Aircraft engines didn’t start at -20F on the eastern front because of paraffin based oil, you were largely told a myth. A much bigger factor was bearing clearance. The Russians understood reliability in the field. The German fascination with precision clearances worked against them. This isn’t an internet story, one of the first people I ever worked for was named Verner Haberman, and he knew the story from personal experience in 1943. Above, My 5th bearing running in our front yard in 2008. This is the same design that flew 450 hours on Mark Langford’s KR-2s. Just like a Lycoming thrust bearing, there is no ‘bearing’ in my design. The crank rides directly on the case material. The bore diameter is 3.375″. This makes it more susceptible to temp. growth/contraction issues, but any combination of Aluminum case, steel crank is going to face this in proportion to its size. Lycoming works with a lot of room temp clearance, but at a certain OAT, you have to pre heat the engine to prevent it from having no clearance on start up. To explain why testing is important, let me relate a 2009 story: At this point Mark Langford is flight testing our 5th bearing. We don’t sell things that are not tested, and Mark offered to do this work for us. We set up the bearing housing and the crank at a very tight clearance, with a nod toward seeing if we could keep it tight after the system was at operating temps. The target was .001 to .0015″ clearance. (I chose this number, not Mark.) I had neglected to consider the lesson of Mr. Haberman. One morning when Mark had about 75 hours on the bearing he went outside to start his engine at 25F with no pre-heat. It ran for 30 seconds or so and came to a halt, locked up tight. The engine had 20w-50 oil in it, but I don’t think that was the main issue, it was the clearance. The engine had done fine through the fall, but it reached it’s limit at 25F. OK, Why will a Corvair car with .0015″ main bearing clearance start at 25F without issue? Because the mains on the engine are 2.0″ in diameter, and my 3.375″ 5th bearing was subjected to different amount of expansion and contraction. On any Corvair flight engine, the 5th bearing is going to be the clearance issue. Roy’s bearing is 3.0″ diameter and Dan’s is 3.25″. It isn’t just the size that matters, it is the starting clearance also. Dan shoots for .0007 to .001″ clearance per inch of diameter. This is why Dan’s bearings require a High Volume pump. When they are hot, the extra clearance will drop the idling oil pressure with a stock pump. Dan didn’t make up this idea himself, he is following the bearing manufacturers specs. You could probably start Dan’s set up down to zero F without issue. Roy tends to run his bearing tighter than Dan’s. This is why few of Roy’s bearings need a high volume pump to maintain 20 psi as a hot idling oil pressure. The opposite side of this is that people using that design need to ask Roy about the minimum OAT for a cold start without a pre-heat. These Articles discuss the relationship to the oil pressure indicating if the engine is ready to be operated. On a Contenintal, you can use full power with oil at 100F, But, the engine must not have excessive oil pressure, caused by the relief valve not being able to bypass cold oil fast enough. If you have a High volume housing and pump from us, I have machined this port larger for you. This is in the photo below, indicated by the drill bit. Lets’ say its 35 degrees out and you start your Corvair. If your normal oil pressure regulates at 45 psi, then you will undoubtedly see the oil pressure exceed this, even with an enlarged bypass. You may see as much as 75 psi. Do not rev the engine up, let it idle. In a few minutes the engine will warm up the oil enough to bring the oil pressure down. What you are watching for is the point where you can do the run up on the aircraft and have the oil pressure regulate normally, at no more than 10psi above its normal regulated pressure. This will likely happen when the engine oil reaches 140-150F. If this takes a long time with 15w40 Rotella, you are fully invited to switch to 5W-30 Amsoil, and it will happen a lot faster. With Rotella, this may take 6-8 minutes. If this isn’t fast enough for you, let me ask what is the hurry? The Corvairs requirements are no different from Lycoming nor Contenintal’s. Go to your FBO and tell them that you are going to rent one of their planes, but you are unwilling to warm the plane up for 10 minutes if required, because you’re a busy guy, and your time is so important. Watch how fast they slam the door in your face. They own that engine, they don’t want it damaged, and they don’t want people who disregard manufacturers instructions near them. Your Corvair is your own masterpiece, treat it at least as well as student pilots at the FBO treat the rental equipment. Why not get a thermostat? This will allow me to take off in 3 minutes instead of six, right? OK, for some background, go to google and search the words “Lycoming Flyer Operations” and get a look at pages 66-69. This gives a beginning description of systems that have a bypass like the Corvair and half of Lycomings, and systems that have a ‘Vernatherm’ (Lycomings term for an oil thermostat.) If anyone wants to debate that an oil bypass system allows the engine to warm up faster, realize that I have Lycoming and all their official publications on my side of the discussion. It does some of the same task as a thermostat in a simpler, smaller more reliable way. Second, know that many Lycomings run 50 weight oil, and they need this system more than a Corvair with thinner oil. A thermostat is something that is only going to operate on your plane for the few minutes until the oil reaches 180F on a cold day. For 98 out of 100 hours a year, it is going to be open and doing nothing more than what the bypass does. Does this justify the added complexity and fittings? Should you just have the oil system set up for how it is going to run 98% of the time, with the most simple system that can accomplish this? OK, let’s get this point fixed in everyone’s mind: They made 1.8 million Corvairs If they made on 70,000 miles each and drove this at a 35 mph average, then each car made 2,000 hours on average, which means the fleet made it to 3.6 Billion hours of operation. If only 5% of the operation was done below 32 degrees as a starting temp, I would be stunned, but lets use that as a conservative number. That means 180 Million hours of operations we done under these conditions. Was every one of these engines carefully pre-heated? Was every start up held for 10 minutes until the oil was at 140 degrees? Was any of these hours logged with quality oil? Of course not. The system we use on Corvairs is identical to the system used in cars. There is going to be a car guy who writes me to say that cars had thermostatic damper doors on the bottom of the car, and that they did something to regulate the speed that the car warmed up the oil. To this, I am going to point out that I firmly believe that most car owners waited less than 15 seconds after the car started to put it in gear as a habit. No system, damper doors or not, was having an effect at that point. Today the only people who own Corvair cars are people who love and respect them, and warm them up slowly. Trust me, the last guy to drive your core engine in the winter of 1979, didn’t treat it according to the owner’s manual in the glove box, and the damper doors were long since gone on your core engine. Below are some samples of stories from our webpage. The captions are the original ones with the year added in front. I put them in blue italics to show what we were speaking of at the time. The black notes are my comments today. If you still think that someone this week on the net is going to ‘discover’ something about the engines oil system I have not considered, read on and note the years. (2007) The Corvair has an outstanding oil system. Builders are disassembling hundreds of core motors a year. These come from cars that have been sitting for many years. Most of these cars never received an oil change the last two or three years of their lives. They were continuously run low on oil and beaten like dogs. Yet just about every builder is rewarded with a crank that can be polished, or have a simple .010/.010 regrind. This is all the evidence you need to appreciate the quality of the GM design. Just like the Doctor’s Oath, your first vow is to do no harm. Many modifications that inexperienced builders propose are a serious reduction on the Corvair’s reliable oil system. Until I understood the operation of the system, I too took detours. My Pietenpol was the first Corvair to fly with a rear starter. It used a 3-hose oil system, an arrangement I now consider a mistake. Read the information here carefully, and you’ll avoid repeating missteps people have already paid for. All Corvair engines need an oil filter, oil cooler, filter bypass and cooler bypass. The above photo shows two pencils pointing at the Corvair’s stock bypasses. The one in the rear case is the cooler bypass, and the one in the top cover is the filter bypass. They’re both set to open at 7 psi (they’re the same part). You can read all about my testing of oil accessory cases and the specific rig we built to do this on our Web site. Systems without bypasses, particularly cooler bypasses, will starve the engine for oil. Five years ago, we tested filters and coolers by packing them in ice to simulate a start at 32F. The cooler bypassed for more than 10 minutes, whereas a filter packed in ice only developed a 2 psi differential. Coolers without bypasses can cause massive restrictions in oil flow. If your pressure sending unit occurs before the cooler, you’ll have no idea that the pressure to the bearings is dropping on every start. (2008) Above are two views of the optional Gold HP Oil Cooler Bypass. It is often referred to as a Sandwich Adapter because when installed, it’s sandwiched between the Gold Oil Filter Housing and the oil filter. It’s held in place by a very accurately machined, hollow mounting bolt. It can be installed on the Gold Oil Filter Housing in literally one minute. It includes a square o-ring gasket, held in place in a deep recess. The AN-6 fittings for the lines to and from the cooler can be clocked in any position. It contains an all metal cooler bypass featuring a precision spring manufactured by the nation’s foremost supplier of aerospace springs. On a normal start cycle, the cool oil in the cooler will produce a pressure drop in excess of 7 psi. Any time this is so, this bypass valve senses the pressure differential and allows the oil to bypass the cooler, greatly speeding up the elapsed time until the oil reaches 150F. The drill bit is pointing to the pressure regulator bypass hole. It has to be opened up when you install a high volume pump. Otherwise the pressure will be very high until the oil temp is thoroughly warmed up. The enlarged hole allows the bypass to work with cold thick oil. Without enlarging this hole it might take 15 minutes of running on the ground on a 40 F day before the oil settled down to its normal regulated pressure. Before this, an increase in rpm will raise the oil pressure. On very cold start ups you want to watch this, because even with the hole enlarged it is possible to have the oil pressure exceed 80 pounds by carelessly revving the engine to taxi it while the oil is still cold. Give the engine a chance to warm up, don’t be in a rush. Oil pressure spikes are very rough on the drive system running the pump. This is true of almost all engines, not just Corvairs. People don’t talk about ideas like this with the buy-it-in–a-box imported engines because they just wanted to buy something and use it. Since the primary motivation with Corvair builders is to learn while creating, we talk about things. Most people are happy to just have things, people attracted to the Corvair were the ones who took apart the toaster at age 10, because for some of us, we need to know why. Below is a series of photos of oil testing. This is on our website. It is 10 years old this month. Get a good look, no one notices this but there are beers cooling in the bucket next to the oil cooler. Testing is a tough job, but I was willing to do it. I am bigger fan of Mich than Becks Dark. Oil cooler is in bucket. Bypass stayed open with a 7psi differential or more until the water in the bucket hit more than 130F. Beer as long gone before then. If somebody would like to differ with me on oil systems, that’s fine, but unless they have 10-year-old test photos, it’s going to be their guess vs my test. Above, look at the instrumentation, were we have probes on both inlet and outlet lines to compare the differential. The engine in the photo is the original Skycoupe 2,700 cc power plant. Note that the stock oil filter is being cold soaked to measure the differential pressure with 32 degree oil. It was only 2 psi.